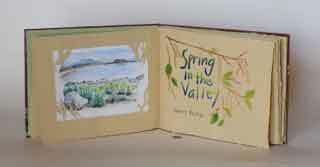 There is a lot of discussion going on about what an artists' book is. Like trying to define "What is art? ", there is no single right answer. For us the term artists' book simply means a book made by an artist; a book made as a work of art rather than as a literary artifact. In this case we use the term to denote both one-of-a-kind and edition books. 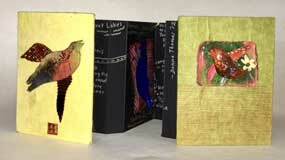 Some of these artists books are for sale, some are in exhibits, some have been sold and some we are not ready to sell. 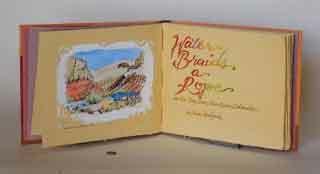 Most of Donna's one-of-a-kind artist's books feature her calligraphy and watercolor paintings and are often full bound in leather with leather onlays in a slipcase with chemise or in a clamshell box. San Antonio (2016) Naomi Shihab Nye. 2 7/8 by 5 3/8 by 1 3/8 inches.This is a beautiful love poem written by the celebrated poet from San Antonio. Peter's bold pulp-painted paper, suggesting the bright colors of the rich cultures of the southwestern USA, is woven together to create the accordioned text pages. Three dominoes are inset into the leather cover, referencing the poem�s contents. $975.00. 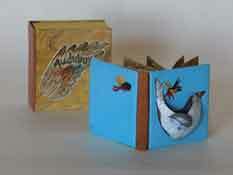 A History of the Accordion Book (2017) by Peter Thomas. A book made out of a Hohner accordion. Text is the history of the accordion with hand colored digitally printed photographs 11 inches tall by 6 inches wide by 15 inches long when closed. 22 accordion pages. $1,850. Click for more images & info. 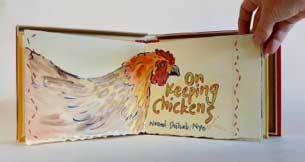 The Concertina Book. (2014) by Peter Thomas. 7 by 7 by 7 inches. 18 accordion pages. $1,850. A Brief History of the Ukulele. Ukulele Series Book Number 23. (2003) 18 by 6 by 3 inches, $1,250. Edition of fifteen copies. A device for testing if an artist book works or not. On permanent display at the San Francisco Center for the Book. Three Kinds of Magic (2000) Unique structural book. 6 by 4 by 2.5 inches. $1850. Mac’s ABCs (1996) 7.25 by 5.5 inches. A alphabet primer for baby computers. $1900. Ficciones (2006) by Jorge Luis Borges. Silver Sierra (2013) by Gary Millar. 6 by 5 3/4 inches. 16 pages. $sold. Stockings (2014) by An non. 5 1/4 by 3 5/8 inches. 16 accordion pages. $sold. Story (2013) Terry Tempest Williams. 5 by 6 inches. 10 accordion pages. $sold. In The Middle. Compiled and edited by Peter and Donna Thomas (2004) 11 1/4 by 8 1/8 inches. 14 pages and 12 scrolls. 24 copies. Never made available for sale. Escape (2001) By Donna Thomas. 5 5/16 x 5 1/4 inches. 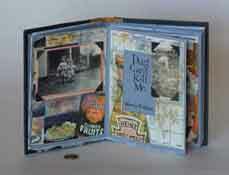 An accordion book with watercolor paintings of nudes and small landscape painting .Clamshell box.$3000. Sold. Yellowstone (2011) Donna Thomas 6 ¼ x 9 3/8”. Medieval wooden board binding, 7 full page illustrations plus more. $2975. Sold Click here for more images and information. Columbine (2011) Mary Austin. 5 ¾ by 7 ¼ inches. 10 accordion pages. 6 watercolor illustrations. Hetch Hetchy Valley – a grand landscape garden (2011) John Muir. 4 ½ by 5 3/8. 5 illustrations. Ditty of First Desire (2007) A poem by Federico Garcia Lorca. 5.5 x 5 .5 inches. A unique "cootie-catcher" shaped book made using paste papers with paintings of nudes. Clamshell box. Sold.